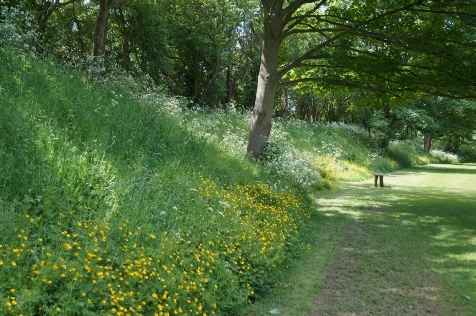 The earthwork remains of a major Norman fortification that originally acted as the administrative centre for Oxfordshire and Buckinghamshire. Today no (visible) stonework remains but the earth ramparts are impressive. The site is a public park. 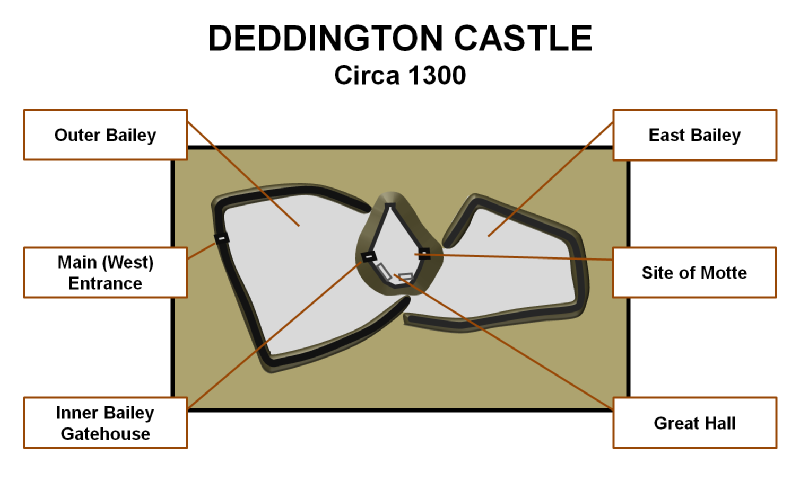 Deddington Castle Layout. When originally built the castle simply consisted of the Outer Bailey with a motte in the eastern extremity. This was later enclosed within an Inner Bailey with a substantial stone curtain wall raised in the mid-twelfth century. Precisely when the East Bailey was added is uncertain. Notes: The site is accessed off Castle Street (sign-posted for pedestrians) but there are no car parking facilities immediately adjacent. Instead follow Castle Street into the centre of the village (another 150 metres) where there is a small car park/on-road parking. Deddington Castle was built by Odo, Bishop of Bayeux in the years following the Norman Conquest. An unusually large fortification, it served as the administrative centre for his vast estates in Oxfordshire and Buckinghamshire. It was occupied until the fourteenth century and then plundered for its stone. 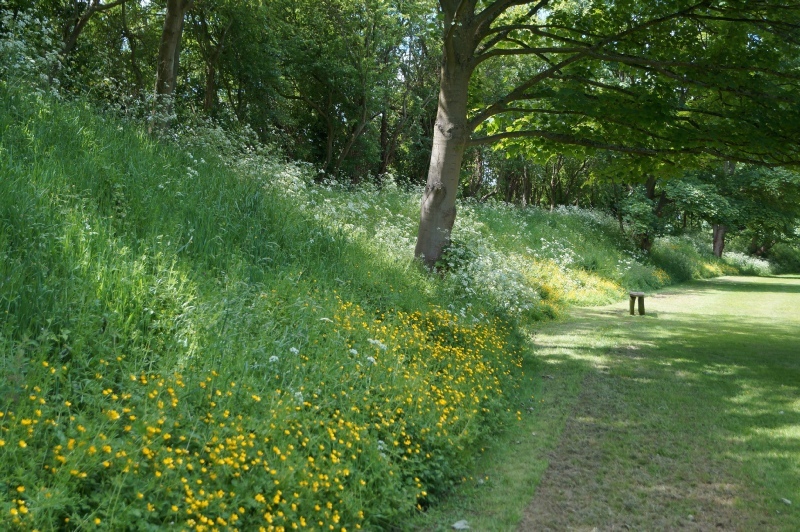 Little is known about pre-Norman Deddington although the name, meaning 'place of Daeda', suggests Mercian origins whilst archaeological evidence has confirmed a Saxon presence on the site. Following the invasion an unusually large castle was raised by Odo, Bishop of Bayeux. He was the half brother of King William (the Conqueror) and was granted extensive lands including substantial holdings in both Oxfordshire and Buckinghamshire. Deddington Castle was the administrative centre of these estates. The castle was originally raised as a motte-and-bailey fortification and enclosed over 8 acres. This area was later sub-divided by an internal rampart creating Inner and Outer Bailey with the former including the motte, which was almost certainly topped by a timber tower, and an 'L' shaped hall. A third bailey, to the east of the existing structure, was also added. After the death of William I in 1087, Odo defied the former King's wishes that England would be inherited by his second eldest son, William Rufus. Like many of the Norman magnates, he sought both England and Normandy to be under single ownership to prevent competing loyalties. Accordingly he supported William's eldest son - Robert Curthose, Duke of Normandy - to take the Crown of England. But William Rufus captured Odo after a six week siege of Pevensey Castle after which he was exiled from England and his estates confiscated. What happened to Deddington at this time is unknown although it would also have initially been taken into Royal ownership. Seemingly granted to Robert de Beaumont, Earl of Leicester by 1130, it thereafter passed into the control of William de Chesney. In 1139 England descended into civil war - known as the Anarchy - as the rival claimants of King Stephen and Queen Matilda vied for the throne. William de Chesney was an enthusiastic supporter of Stephen and became the military governor of Oxfordshire where he established/re-fortified a number of castles. Some historians suggest Deddington was probably one of these although this cannot be confirmed; the first recorded reference noting William's ownership of the site dates from 1157 – several years after the war had finished. William certainly made significant additions to Deddington: around 1160 a stone structure, presumably a Keep, was built adjacent to the motte and the Great Hall was rebuilt. In the following years the motte was levelled and Inner Bailey completely enclosed by stone curtain wall and gatehouse. William de Chesney died in the mid-1170s and Deddington passed to his nephew, Ralph Murdac. However, he quarrelled with Richard I which ultimately saw the manor divided into three with the castle passing to Guy de Dive due to his marriage to Lucy de Chesney, grand-daughter of William de Chesney. At some point during his tenure it was taken into Royal ownership although it was returned in 1205. The castle remained with the de Dive family throughout the thirteenth century although the condition of the defences was seemingly poor. During a local skirmish in 1281, it was attacked by Robert of Aston who broke down the gates. A report of 1310 confirmed the site to be in a poor condition but it was still clearly a functional site for it was used to hold Piers Gaveston, the unpopular favourite of Edward II, two years later. He was subsequently tried and executed at Warwick Castle by the Earls of Warwick and Lancaster. Thomas de Dive sold the castle to the Canons of Windsor in 1364. They subsequently sold masonry from the structure to Bicestor Priory which, along with subsequent plundering that continued until the twentieth century, reduced the mighty castle to nothing more than earthworks. Nevertheless, despite its depleted state, the site was still used during the English Civil War. The castle's proximity to Oxford, the Royalist capital, saw the earthworks periodically used as a camp for soldiers and a skirmish was fought in the immediately vicinity between Royalist and Parliamentary (under Robert Devereux, Earl of Essex) forces in September 1643.